I live in an area that is semi-arid, and after a long, hot summer, the forests are tinder-dry, and very susceptible to fire. Whether by nature, such as lightning strikes, or man's carelessness, rarely does a summer pass that we don't experience the ravages of forest fires. We thought we had dodged a bullet this year, but it was not to be. In a little community called Peachland (Can you get any more charming than that? ), a forest fire was sparked on Sunday afternoon. The wind was exceptionally strong that day and before anyone realized what was happening, a small blaze grew into a powerful inferno. 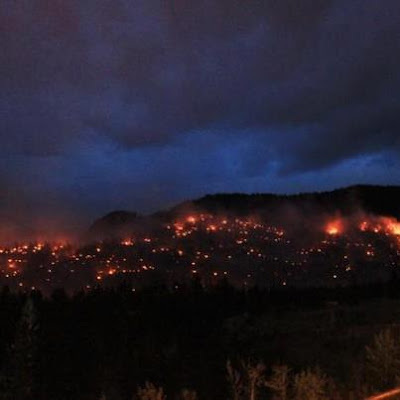 Peachland is about 5 km away from us and from where we live we could see the black and yellow smoke billowing over the hill between our communities! I panicked, as I usually do, and started packing, fearing we would be evacuated. But what do you pack? What would you take when you can only fill up one or two vehicles, if you even have enough notice to do that? We have some unfortunate experience with that and we now know what to gather up and we keep it together for fast access. Family photos, a photo inventory of our goods, the deeds, insurance and other papers related to our house, passports, precious jewelry in the sense of the family legacy, computer hard drive ....and then it starts to get dicey! This is the first time I have had so many Stampin' Up tools and stamps, and my heart sunk as I realized I wouldn't be able to bring it all. Luckily for us, the wind changed direction, then died down, letting fire fighters get a handle on things, but before it did, 1500 people were evacuated and 4 homes were lost! My heart goes out to those people affected. I know some of them had very little warning, and probably lost many irreplaceable family treasures. But it is a sure way to tell what is important to you! But on to brighter subjects like MOJO Monday! I created this card for the 258th sketch challenge, designed by Julee Tilman and it's very unique this week. Isn't it unique? The choice of colour came from another challenge, a new one for me called Dynamic Duos. 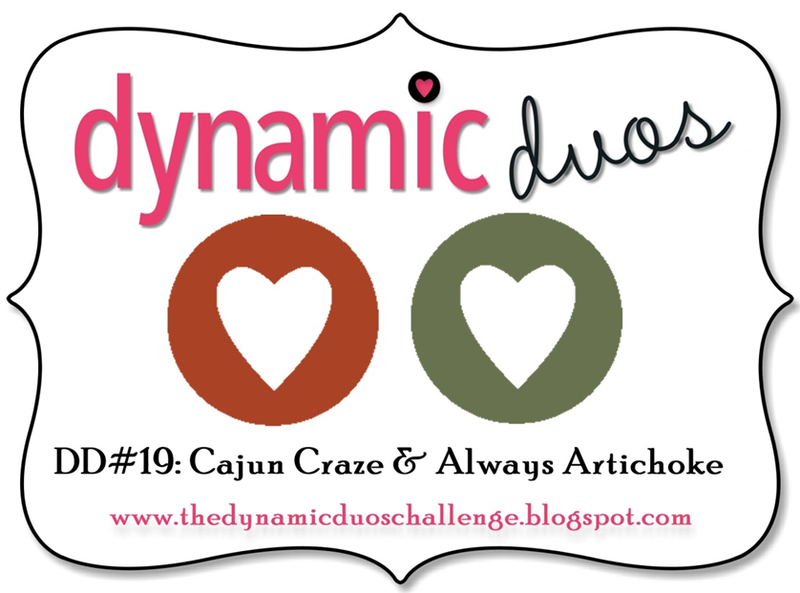 They gave us a pair of colours to create with: Always Artichoke and Cajun Craze. I love how homespun they look together. I like the geometric effect of the Chevron Embossing design behind all the lacy pieces! Not much else to tell. I fussy cut the flower, leaves (from the Stippled Blossoms stamp set) and the top circle, but the rest were punched with our circle and scallop circles punches. So happy creating, and take a moment to be thankful for what you have! So beautiful! I love the embossing you chose and the pretty flower! Thanks for playing along with Dynamic Duos! I'm so glad the wind changed! And so sorry for those who did lose their homes. I'm from Colorado and we had experiences like this early in the summer. It is horrible to realize that your craft stash could be lost. If this is remotely typical for you - be sure to have pictures or videos of your stamp supplies because no insurance company anywhere would believe how much money we have into our stash!! I adore your card - Love the doily layers and the simple little flower to accent it all. SO glad to see you at Dynamic Duos! Delightful card! I love all the elements you used to follow the sketch you chose. 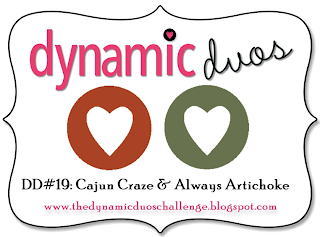 Thanks for joining us this week at Dynamic Duos!